Belanger Engineering > Building Systems and Engineering Blog > Thermographic Analysis: Is It Right for You? Thermographic Analysis: Is It Right for You? Ensuring that your building is as energy efficient as possible is an idea that is quickly gaining in popularity. Not only will an efficient build save you a lot of money on utilities in the long run, but you can also qualify for government credits and reduce your carbon footprint as well. In order to ensure that you’re getting the best energy efficiency rating possible, one of the tools you can use is thermographic analysis. Thermographic analysis is something that is often seen in movies, so you most likely have a little bit of knowledge about the process already. A specialized sensor is pointed at a building and gives a thermographic reading of the heat output. The person operating this equipment is able to look at the readout and find the hot and cold points, determine if the materials used are operating effectively, and even if there are leaks somewhere in the structure that need to be repaired. Because thermographic analysis is often used on large building projects, a small home owner doesn’t necessarily need this done to determine the efficiency of their home. An energy audit could be used to reach many of the same conclusions. 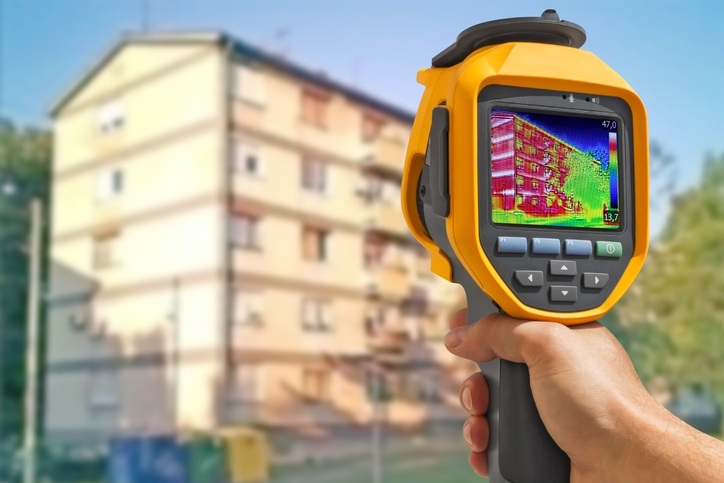 Large buildings work well with thermographic analysis because the visual of a larger space all at once enables the engineer to look at the entire picture and pinpoint inadequacies much faster. If you would like to have a thermographic analysis completed on your building structure, our team at Belanger Engineering would like to help. Contact us today and let us show you how you can make your build the best possible build it can be.